Padma Priya Devarajan is an accredited trainer from ICAgile. Padma Priya has been practising Scrum since 2007 and has hands-on experience in training, mentoring and transforming agile teams. With her speciality being a Scrum Master for teams, she has tutored and helped individuals, teams, and organisations in their Agile journey. She also provided product development consultation and process coaching for start-ups in Chennai. 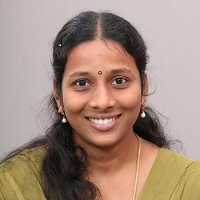 Among her other qualifications, Padma Priya is also a community leader in the Agile30 Meetup group in Chennai. Agile transformation for new teams. Facilitate daily scrums, sprint planning, sprint reviews and sprint retrospectives. • Liaison between the Product Owner and the Development team to refine the backlog. • Remove impediments and prevent distractions. • Participate in a Scrum of Scrums for an internationally distributed team. • Facilitate discussions and conflict resolution. • Empower the teams to self-organize..
• Utilize Rally to find areas in which the team can improve upon. Explore the most optimized way of testing in agile model using tools and techniques. The trainer was interactive and had an in-depth knowledge of the subject. Great session! The training was very informative. It helped me to approach projects with an Agile approach.